Plus tons of other new information. Simon Belmont from the Castlevania series, King K. Rool from the Donkey Kong Country series, and Echo fighters (fighters based on existing fighters, but with a different visual appearance) Richter Belmont from the Castlevania series (based on Simon Belmont), Chrom from the Fire Emblem series (based on Roy), and Dark Samus from the Metroid series (based on Samus) will be playable in Super Smash Bros. Ultimate, NIntendo announced. Simon Belmont: Simon’s signature weapon is, of course, his whip, with special attacks true to the Castlevania series, including the axe, cross, holy water and Grand Cross Final Smash. His stage is Dracula’s Castle, with candlesticks that release an item when destroyed. Alucard, the tragic hero from Castlevania: Symphony of the Night, appears as an Assist Trophy, lending his cursed steel in battle. Richter Belmont, a descendant of Simon Belmont and the star of his own Castlevania games, also joins the Super Smash Bros. Ultimate roster as an Echo fighter. King K. Rool: As the beloved villain from all three Donkey Kong Country games on Super NES, King K. Rool joins Super Smash Bros. Ultimate as a playable fighter. He attacks with a blunderbuss that can fire cannonballs at opponents, and throws his crown, which acts like a boomerang. Echo Fighters: Echo fighters in Super Smash Bros. Ultimate have move sets based on other fighters, but a different visual appearance. 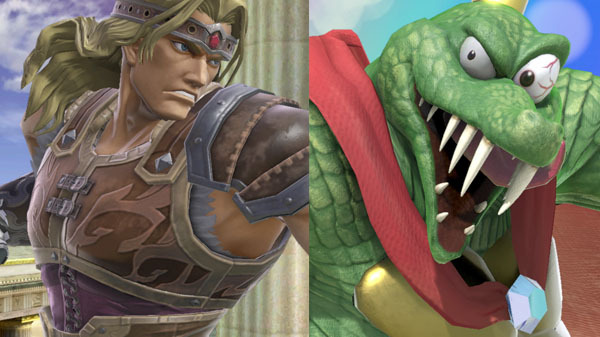 In addition to Richter Belmont, two other Echo fighters in the game are Chrom from the Fire Emblem series (Echo fighter for Roy) and Dark Samus from the Metroidgames (Echo fighter for Samus). Echo fighters can be displayed as separate fighters on the character select screen or stacked on top of the character they are echoing. When stacked, players can change between them with the press of a button. It’s up to players to decide how they want them displayed. Stages: Returning favorites with new visuals and tweaks will make up most of the stages in Super Smash Bros. Ultimate, but there are new stages in the mix as well. These include Dracula’s Castle from the Castlevania series and New Donk City Hall from the Super Mario Odyssey game. More than 100 stages will be in the game, but because the popular Battlefield and Omega forms can also be selected for each stage, more than 300 total stages are available right from the start! Each stage in the game will also support eight-player battles (additional accessories may be required for multiplayer modes and are sold separately) and feature the ability to turn off hazards like the Yellow Devil in Wily Castle. Stage Morph: In a Super Smash Bros. first, the Stage Morph option will let players seamlessly transition between two different stages. When you select this option in the rules, one stage will transform into another during battle. Music: For fans that want it all, My Music lets players select specific music tracks for each stage. Up until now, each stage had its own music track. But in Super Smash Bros. Ultimate, players can select tracks by series. If they are fighting on a stage from The Legend of Zelda, for example, they can select any music track included from that franchise, including new additions like The Legend of Zelda: Breath of the Wild – Main Theme. Counting game music tracks and other music, like in-game menus and other short musical passages, there are approximately 900 compositions – that’s more than 28 hours of video game music! When playing in Handheld mode, music can be played even while the Nintendo Switch screen is turned off, turning the system into its own portable music player. Items: New items being added to Super Smash Bros. Ultimate include the Banana Gun, Killing Edge, Bomber, Death’s Scythe, Staff, Ramblin’ Evil Mushroom and Rage Blaster, among others from a wide variety of different video game franchises. Items in the game can be picked up and used offensively and defensively in battle. Pokémon: After players throw a Poké Ball in the game, many new and returning Pokémon may appear to assist in battle. Some of these Pokémon include Abra, Solgaleo, Lunala, Mimikyu and the enormous Alolan Exeggutor. Assist Trophies: Some of the new Assist Trophies that are joining Super Smash Bros. Ultimate include Zero from the Mega Man X series, Knuckles from Sonic The Hedgehog, Krystal from Star Fox Adventures, Rathalos from the Monster Hunter series, Shovel Knight from, well, Shovel Knight and the evil Moon from The Legend of Zelda: Majora’s Mask. Classic Mode: The single-player mode in which players battle against a series of fighters will return in Super Smash Bros. Ultimate. Each fighter has a set of stages and opponents that she or he will face. Stamina Battle: In addition to Time Battle and Stock Battle, Stamina Battle is also one of the standard modes in Super Smash Bros. Ultimate. In Stamina Battle, players fight to deplete each other’s stamina until only one fighter is left standing. Final Smash Meter: In addition to regular Final Smashes that can be activated after breaking a Smash Ball, the Final Smash Meter is now a selectable option. If enabled, players can charge their Final Smash Meter over the course of a battle. Once the Final Smash Meter is fully charged, players can unleash a less powerful Final Smash attack. Squad Strike: When playing Squad Strike, players will participate in 5-on-5 or 3-on-3 skirmishes, with each player using either five or three consecutive fighters in one battle. Tourney Mode: Up to 32 players can participate in Tourney mode, making it great for parties or events with a lot of people. And since Nintendo Switch can be played anywhere, these tournaments can even take place in unexpected places! Smashdown: After battling in this mode, the previously selected fighters will no longer be available, forcing players to have to pick a different fighter for the next round. This mode favors players who are skilled with multiple fighters and encourages others to diversify their rosters. Training: The improved Training mode in Super Smash Bros. Ultimateincludes an exclusive stage that features a grid, used to help measure the distance and trajectory of special moves and fighter knockback. Super Smash Bros. Ultimate is due out for Switch on December 7. Watch a new set of videos below. View a new set of screenshots at the gallery.